Creating Library Features from scratch is a VERY valuable technique to know. It can save you tons of time when you have “common features” that you want to reuse over and over again. In this case let’s say we have a drafted, filleted, pocket that we are tired of creating over and over every day. (Fig. 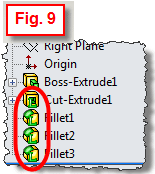 1) We would like to “capture” this feature into the Design Library so that we can just Drag & Drop it into any model. Yes. You do actually have to build it one time. When you do, consider if you want it to be “locked down” with some locating dimensions, or if you want it to remain “free” to position anywhere. 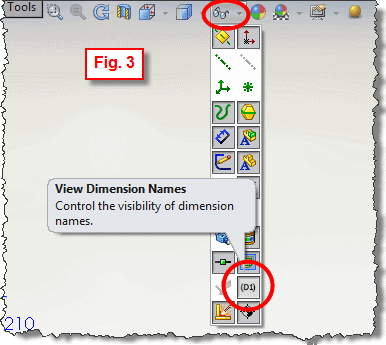 If you do add dimensions to locate the feature (from the side and bottom edges in this case) then you are laying an extra requirement on the end user that they will have to identify those references (edges in this case) when they use it. This action is really repairing the dangling relation/dimension that comes in with the feature. This step is totally optional, but sure does make the part a lot more user friendly. If you just leave everything named “D1@Sketch3” and “D4@Cut-Extrude2” that isn’t going to make a lot of sense to anyone who goes to use this Library Feature. 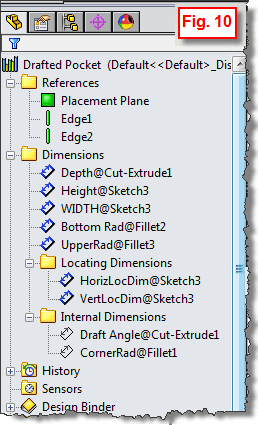 If you right click on the Annotations folder in the Feature Tree and turn on “Show Feature Dimensions” (Fig. 2) this will display ALL of your part dimensions on the screen. 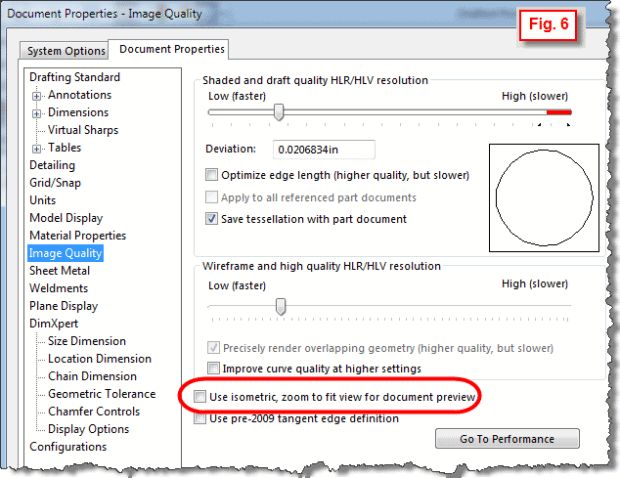 Then if you also turn on “view dimension names” from the heads up view toolbar (Fig. 3), you can see the names that were auto assigned. 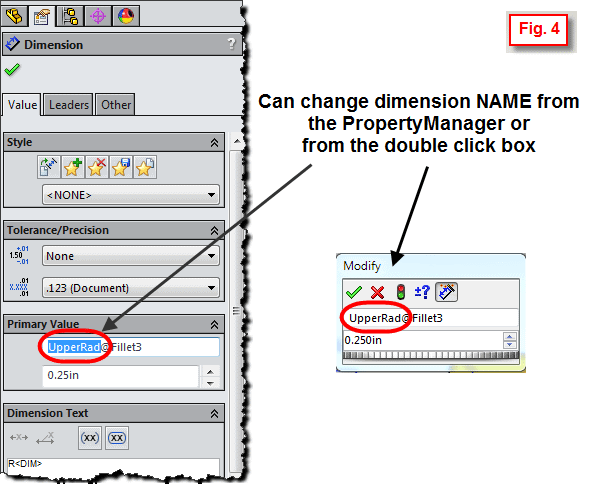 Now you can just select a dimension and over in the Property Manager give it a new name. Or you can double click a dimension and change its name right there. (Fig. 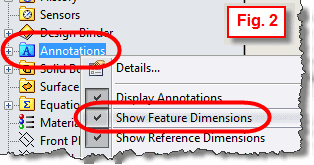 4) You of course only need to worry about renaming the dimensions that you are actually going to use in the library feature. 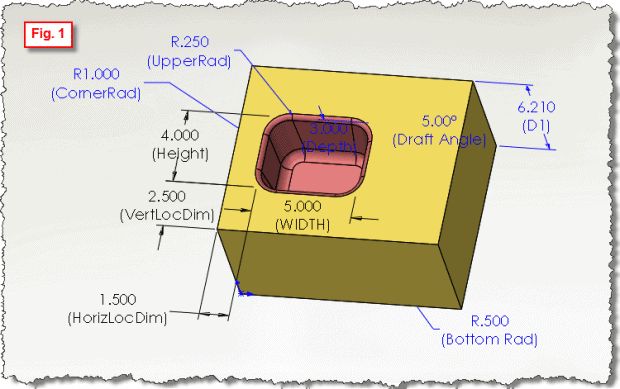 In this example we wouldn’t need to worry about renaming any of the dimensions in the big block. Only those in the “pocket” features. Open up the Design Library in the Task Pane and navigate to the folder you want to store your new library feature in. Hit the “Add To Library” button at the top. (Fig. 7) In the property manager that comes up on the left, under “Items To Add” (Fig. 8), BE SURE to select which features you want included in the Library Feature! (use the flyout feature tree). For example in this model we would select everything EXCEPT the first feature (the big block that we cut the pocket into). 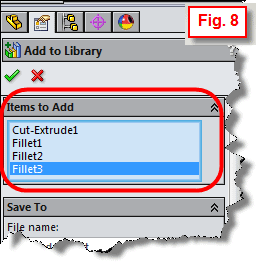 If you included that block then it would also get inserted when you used the Library Feature rather than just the pocket with the fillets. A lot of people miss this step. By the way, you could of course PRE-select the features in the feature tree BEFORE hitting the “Add To Library” button if you wanted… Hit OK to finish adding the features to the library. Now Save the .sldlfp file one more time, and then close all open files. 6. YOU’RE DONE! TRY USING YOUR LIBRARY FEATURE !!! Have fun creating an infinite number of Drag&Drop features in your library to save you tons of time! Have you every used Library Feature? Let me know in the comments why you used it or if you wish you knew about it before now. 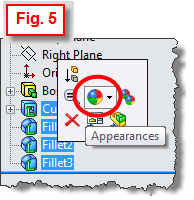 For more SOLIDWORKS Tips and Tricks follow us on Twitter for weekly Tech Tips. Equidistant Uniform Mesh Control. What more do you need?